Full featured mobile optimized options that save time and money. How does anyWarePOS integrate with smartphones? 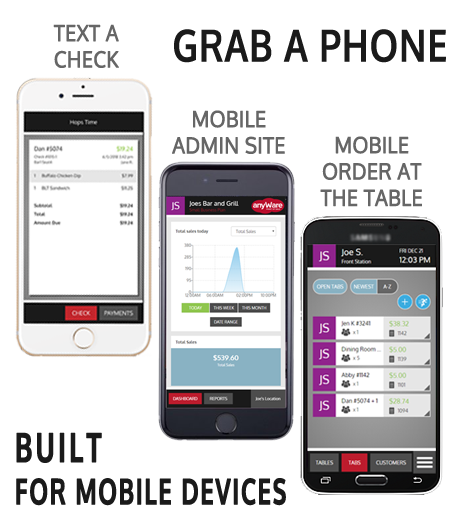 There are many ways that anyWarePOS uses smartphones. Text message a check to customer that they pay on their phone and mobile optimized versions of our pos and admin software. We truly do run on anything. Use a mobile optimized version of our Admin website to view reports from anywhere. Order at the table with a mobile optimized version of the pos they already use on larger devices. Traditional point of sale systems have loads of wires, local servers and bulky components. Run securely from the cloud with any device. 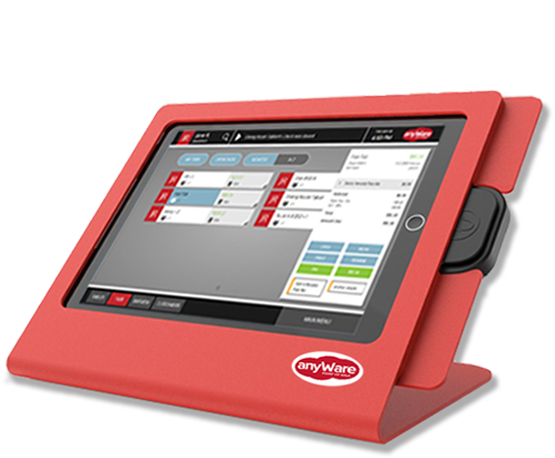 Start using anyWarePOS right now on this browser, a tablet or mobile device. When you are ready, easily add on more stations, printers and readers available from our online store. All software and data is in the cloud. No installations, data-loss worries or installation issues. Our prompt email answer support and optional phone support is waiting to help you. With hundreds more industry standards you'd totally expect.